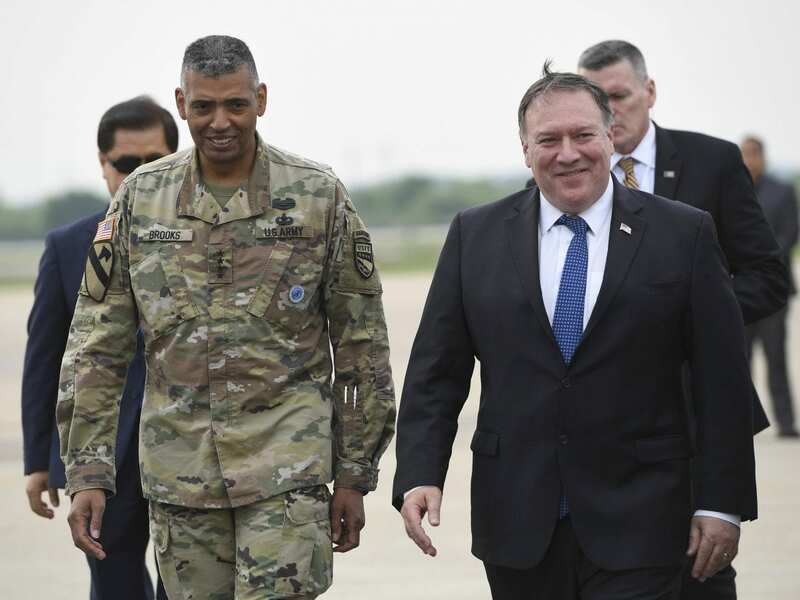 Secretary of State Mike Pompeo said Wednesday that he expects North Korea to take steps toward major nuclear disarmament within the next two-and-a-half years. “Most certainly in the president’s first term,” he said, speaking to a pool of journalists in Seoul, South Korea, where he was meeting his South Korean and Japanese counterparts. Pompeo told reporters he wasn’t going to get into what President Trump and North Korean leader Kim Jong Un discussed during Tuesday’s historic meeting in Singapore. “I’m not going to give any insight into where we are in private talks,” he said. The joint statement released Tuesday was scant on the details, leaving the agreement between Trump and Kim vague. Earlier today, North Korean state media reported that Trump made concessions to Kim that were not in the statement signed by the leaders — including Trump agreeing to “the principle of step-by-step and simultaneous action” rather than the U.S. administration’s prior demands for rapid denuclearization. Pompeo, who is scheduled to travel to Beijing Thursday, said he isn’t sure when the next conversation with North Korea will next take place but that it could happen “fairly quickly” — as soon as the coming week. Pompeo also sought to downplay Trump’s announcement on Tuesday that military exercises with South Korea would be suspended in return for North Korea’s denuclearization. He said that Trump “made it very clear” that the suspension would only last while “good faith negotiations” continued. The next military exercise is scheduled for August, and in years past, has drawn thousands of troops from the U.S., South Korea and other countries.